STURGIS MOTORCYCLE MUSEUM TO HONOR WILLIE G. DAVIDSON with the Lifetime Achievement Award. Sturgis, South Dakota, March 28, 2017 – Considered the patriarch of motorcycling by bikers around the globe, William G. Davidson’s artistic vision and passion for riding have not only shaped Harley-Davidson’s® identity for more than 50 years, they have transformed the entire motorcycle world. Affectionately known as “Willie G.” by millions of motorcycle enthusiasts, Harley-Davidson’s Chief Styling Officer Emeritus and Brand Ambassador is set to be honored with the Lifetime Achievement Award at the Sturgis Motorcycle Museum Hall Of Fame Induction ceremony, August 9, 2017. “Willie G. is not just a brand ambassador for Harley-Davidson, he is an ambassador for biker culture worldwide,” said Myrick Robbins, executive director of the Sturgis Motorcycle Museum & Hall Of Fame. “The Museum’s goal is to ‘Honor the Rider’ and Willie G. is the embodiment of motorcycle riding.” Already a pre-2001 member of the Sturgis Motorcycle Museum Hall of Fame, Willie G. was joined by his lovely wife Nancy in the Class of 2010. 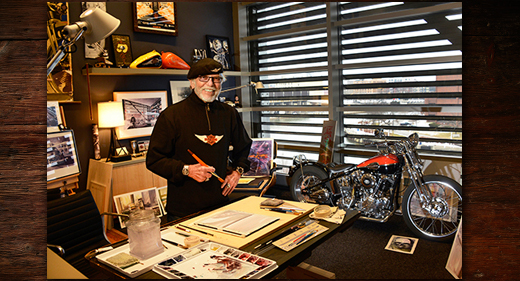 The son of former Harley-Davidson president, William H. Davidson, and the grandson of one of the original founders, William A. Davidson, he has helped shape the iconic look, sound and feel that have defined Harley-Davidson motorcycles for more than 50 years. Starting in the 1970s, he developed iconic designs which kept Harley-Davidson motorcycles selling while the company completed technological and manufacturing improvements. Throughout his career he developed the bikes that came to define Harley-Davidson, from the XLCR™ Cafe Racer up through the V-Rod™ and the Street Glide™. A Wisconsin native, Willie G. went to The University of Wisconsin for three years before transferring to the Art Center College of Design in Los Angeles. He joined Harley-Davidson in 1963, when he was invited to set-up the company’s motorcycle design department. In 1981, Davidson was one of 13 executives who raised more than $75 million to purchase Harley-Davidson from AMF Incorporated.